Now it seems that before it has even taken to the skies the prince has sold the plane on. According to recent reports from Bloomberg newswire , CFO Shadi Sanbar has issued an official statement to the effect that the palace in the skies has been sold on as part of an investment plan via the prince's company, Kingdom Holdings. The selling price and the new owner have not been revealed. 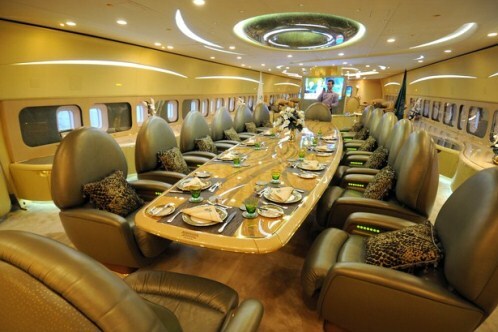 We can guess that the total cost of the plane after its refit was around US$468m, which means theat whoever now owns the plane probably paid just under $500 million for it. Never mind ,what's a little loose change when you can be will be absolutely relaxed zooming off to places as far as 15,500km away - and with tanks sucking-up 320,000 litres of aviation fuel, not even having to think about stopping to refuel. The A380 would normally carry around 550 passengers in Economy, Business and First Class, with some airlines also having a fourth Premium Economy category as well, and others going for all-Economy into which to cram 853 backsides. But our proud billionaire won't have to worry about such crass sharing in his plane: he and his family will indulge in five luxury suites complete with king-size beds, handmade rugs, private lounges, and ensuites with full-size showers . And there'll be First Class sleeper seats in private compartments for up to twenty business and other guests, lounging areas and a dining room ... as well as a Prayer Room where computers will automatically always have prayer mats facing towards Mecca. Guests who go aboard at regular airports will enter through a normal door that will open into a large Entrance Hall with a wide spiral staircase, and a lift if you don't like stairs, going to the aircraft's upper deck. Where permitted at others, that lift will descend through the belly of the aircraft onto the ground below - with a red carpet automatically unfurling, and bathed by floodlights at night so these guests will feel they've arrived at a Hollywood premiere. 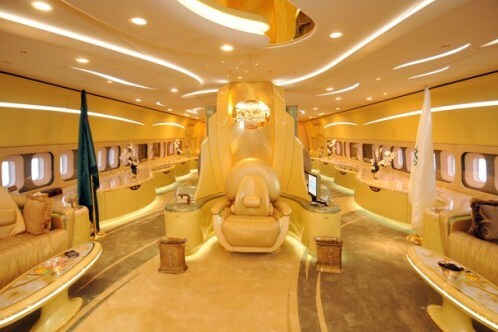 Down in the aircraft's belly, empty cargo and luggage spaces are being turned into recreation zones including a Wellbeing Room with a "Magic Carpet" glass floor to stand on, or lounge around, to look down on the passing world below - with scents of forest and sea for added ambience. And a concert lounge will have a stage and baby grand piano... with the prince owning a number of entertainment companies, top artists will perform for family and guests. Finally a 'garage' in the plane's belly can take a Rolls Royce. Business class isn't looking quite so great now is it?